Submitted by Alexander Briones on Jul. 16, 2018. Originally published on January. 22, 2016 and last updated on July 17, 2018. Here we present you with the best microphones for acoustic guitar, updated for 2018, showcasing market favorite mics that are readily available from major retailers. 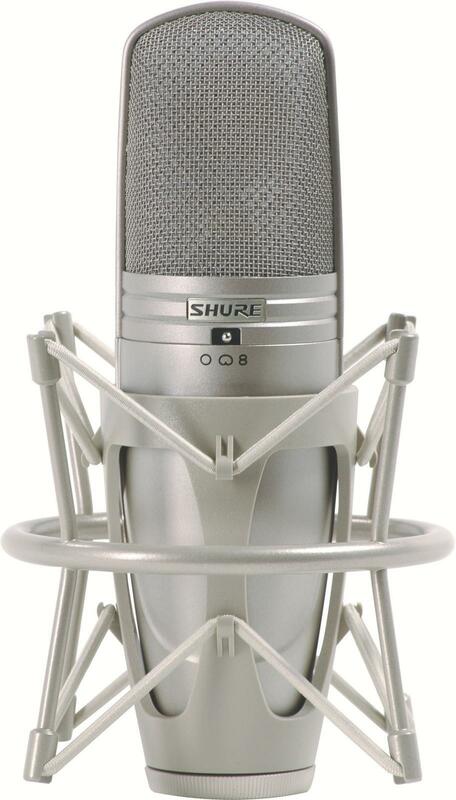 Small and large diaphragm condenser microphones continue to be highly regarded, as can be seen with their high ratings. 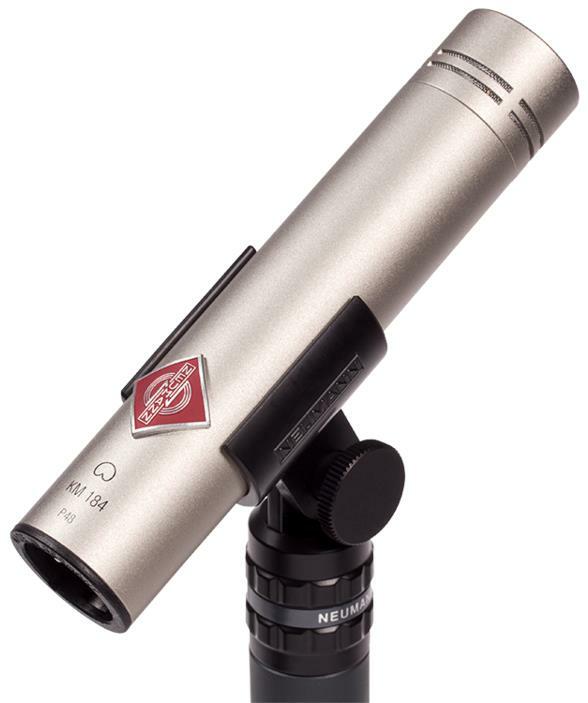 Three mics have joined our recommended list for the first time in this guide, namely the Shure KSM141 SL, Audio-Technica AT4050 and the Neumann KM 184. 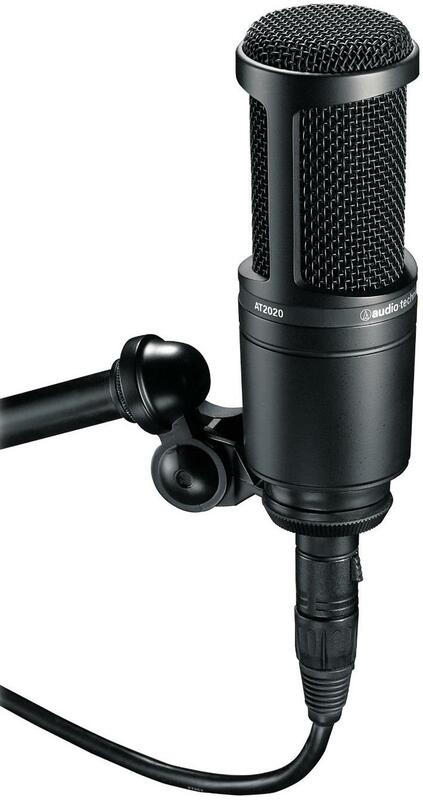 The Audio-Technica ATM450 is an affordable cardioid condenser mic specifically designed to capture the sound of instruments. It is meant specifically for high SPL (Sound Pressure Level) sources like drums, cymbals, amplifier cabinets and more, but it has enough sensitivity to capture the nuances of acoustics. This sensitivity, coupled with its side address design, allow for good and quick placements, which translates to better capture of acoustic guitars, be it for recording in the studio or for live performance on stage. For the price, the ATM450 comes packed with nifty extras, including a built-in 80Hz hi-pass filter and a switchable 10dB pad, both of which make for easier miking of different instruments and play styles. Thanks to this versatility, reviews are consistent in saying that the Audio-Technica ATM450 is a great all-around budget-friendly mic. There are a few who feel that the low-end is lacking, but this can be remedied by closer proximity or EQ. All in all, the Audio-Technica ATM450 is a great value mic that's more than just good for acoustic guitars, highly recommended for home studios. 98 out of 100. Incorporating 225+ ratings and reviews. 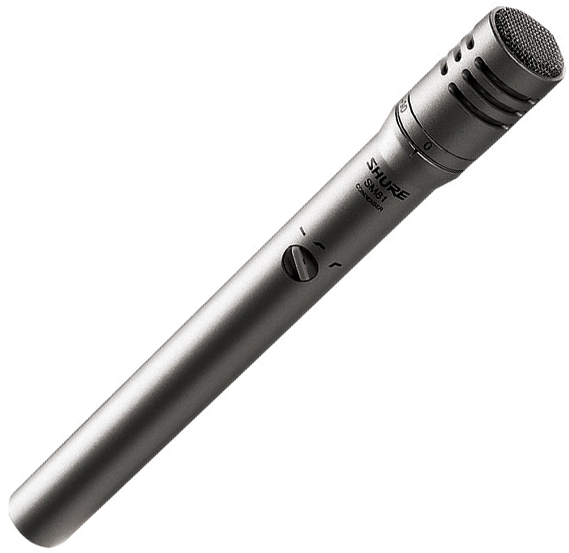 The Shure SM81 tops our list of microphones with its impressive Gearank rating. This cardioid condenser microphone continues to please users and experts everywhere with its transparent and clear sound that's comparable to premium tube microphones. Because of its small diaphragm design, the SM81 is lighter (1.63 lbs) and easy to position than most, handles loud sound sources better with a max SPL (sound pressure level) of 136dB (146dB w/ the built-in Pad), and as such it captures the nuances of acoustic guitars much better - be it during loud strumming or when carefully fingerpicking. This also makes it capable of handling acoustic guitar amplifiers and other loud instruments. The usual downside of small diaphragm mics is its lack of frequency response, but this doesn't seem to be very noticeable with the SM81, with its frequency response of 20Hz-20kHz. Reviews are consistent in saying that the SM81 gives you more sound quality per dollar than similarly priced microphones. And coming from Shure, you can be assured of reliability and consistency without having to shell out too much dough. It's really hard to find fault with it, especially for acoustic guitars, other than its natural limitation of not having the same low frequency emphasis as large diaphragm mics. Retaining the top most spot in this list for a long time now is quite the feat, and looking at current data, there's no reason to believe that it'll be dropping from the #1 spot anytime soon. With its thin 2.5 micron low mass Mylar condenser diaphragm and discrete Class A transformerless preamp, the Shure KSM141 SL is a versatile instrument microphone that can be used for both soft and loud sound sources, thanks to its three position switchable pad (25db, 15db and 0). Its switchable polar pattern adds to the mics overall versatility, making it a practical tool to have in home studios where space and budget are limited. The KSM141 SL's cardioid pattern lets you do traditional mic setups where in the capsule faces the acoustic guitar at your preferred angle. On the other hand, you can use the Omnidirectional pattern to capture ambience or multiple sound sources at once. It also features a three-position subsonic filter that reduces unwanted low-end rumble and background noise. While the features can be a bit daunting for beginners, these are very useful in getting great sounds from your guitar, or from virtually any sound source. And it has to be said that since this is from Shure, you know that it will last you a long time. Large diaphragm microphones continue to be the go-to mic for most home studios, thanks to their ability to capture sonic details. The Audio-Technica AT4050 is a good example of this, with its 0.84" vapor-deposited gold diaphragm, and extended frequency range. While it is more popularly known for handling vocals, it is also widely used for acoustic guitars and other acoustic instruments. The mic's switchable polar patterns and highpass filter adds to its usefulness in the studio, allowing it to capture room ambience, or combine with other mics to add more low-end. It also helps that it looks sleek and stylish, and is highly regarded for its solid build. While it is not meant for working with high SPL sources, it does have good max SPL with its 10dB pad at 159dB, which makes it work well with percussive style acoustic guitar playing. With its good market reputation and flexibility, the Audio-Technica AT4050 will make a good addition to any studio. 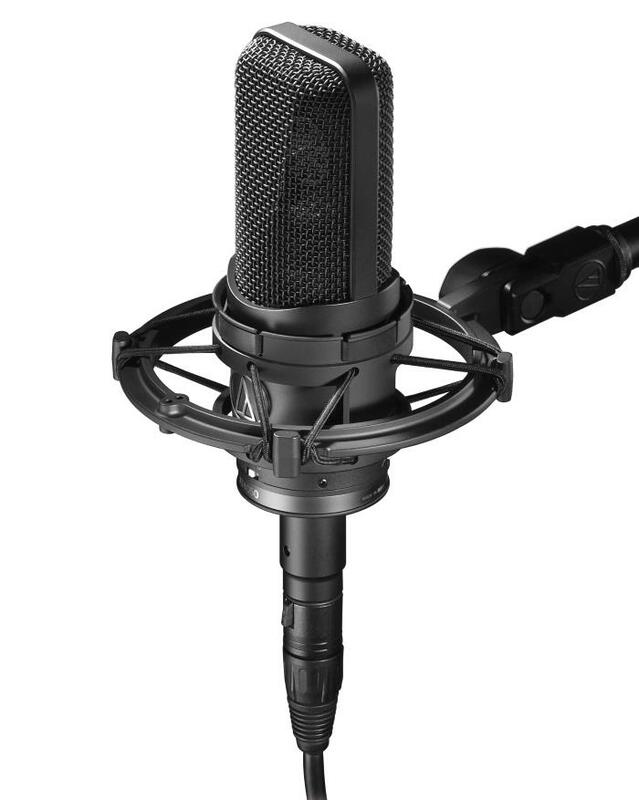 The Neumann KM 184 is a pencil style small diaphragm condenser microphone that can rival the sensitivity of large diaphragm mics, while retaining high SPL handling. It has a frequency range of 20Hz to 20kHz, which is similar to large diaphragm mics, which allows for more detailed sound capture that many users appreciate. Some even go so far as claim that the Neumann KM184 is the best pencil style condenser microphone, and we understand where they are coming from, especially when most users agree. As expected from Neumann, this mic has that premium build and feel to it. And this is matched by its pro-level quiet operation and clarity - even when used on high SPL instruments. There are many reports of it working well with acoustic guitars, and it also gets a lot of thumbs up for how good it works with orchestral instruments, hi-hats, cymbals, and even vocal choirs. There are no common issues to report on, other than the price, but those who wisely invested in the Neumann KM 184 are more than satisfied with what they got. 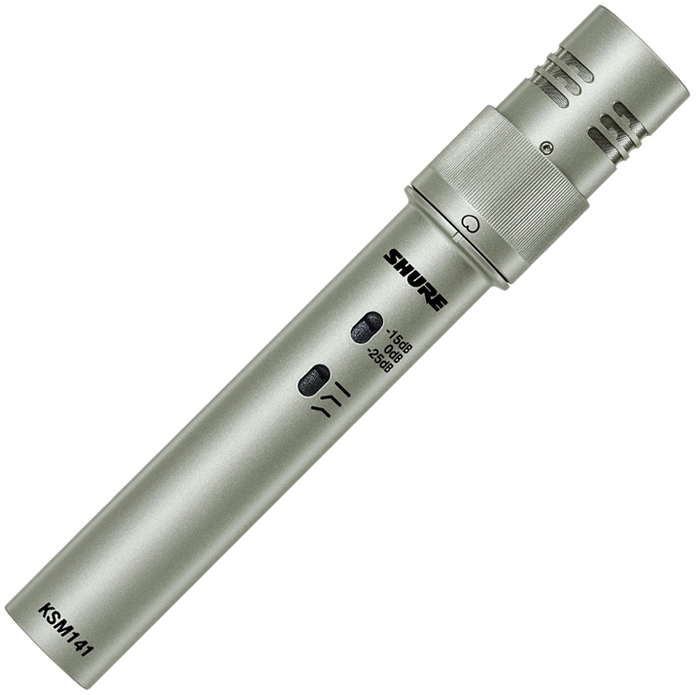 Shure grabs another spot on this list with the KSM44A, a large dual-diaphragm microphone that many are hailing to have the best low noise operation and sonic quality in the sub $1000 price range. Because of its price, not many are able to afford this mic, but those who did have nothing but good things to say about it, which is quite remarkable considering the heightened expectations that comes with its cost. In fact many consider the KSM44A to be well worth the money, thanks to its multi-pattern versatility, great bass extension, and zero coloration. The spec sheet does not mention anything special: frequency response is 20Hz-20kHz, multi-pattern switching (Cardioid, Omni, Figure 8) and switchable 15dB pad for improved max SPL of 137dB. What makes it extra special however is its dual diaphragm design which allows its large diaphragm to behave like two paired small diaphragm mics, allowing it to handle both low and high frequency transients. In layman's terms, it captures acoustic guitar tone really well, down to the nuances of your fingers moving across the fretboard. A minor complaint about the KSM44A is its hefty weigh of 1.0875 lbs, so you'll want a sturdy stand to get this positioned properly in front of the guitar. Now if only it was more affordable it would've gotten more user reviews to take the top spot. If you're looking for a true workhorse go-to microphone for recording acoustic guitar and just about anything else, check out the Shure KSM44A. Mojave Audio is a custom mic shop that was started by David Royer himself, meant to be his outlet for crafting premium microphones. To develop and produce the MA-200, Royer drew from over two decades of experience, resulting in a tube driven condenser microphone that sounds like a well-maintained vintage studio mic. It features military grade JAN 5840 vacuum tubes that reduce high frequency shrills, resulting in a warmer sound that works great on acoustic guitars, vocals and other instruments. Other premium elements include its 3-micron gold sputtered capsule, and the use of Jensen audio transformers, both of which work in conjunction with the vacuum tube to better recreate classic characteristics that many prefer. Note that the MA-200 has a cardioid pattern and it has no built-in pads or filters. The response to the Mojave Audio MA-200 is overwhelmingly positive, to the point that some even regretted not buying the mic earlier. Most users report hearing dramatic improvements in their recordings, especially on acoustic guitars and vocals, with many of them describing the sound to be better than anything they've tried. Since tube mics tend to color the sound of acoustic guitars, it is not ideal for those who prioritize transparency. Still, even skeptics who wanted transparent mics found themselves impressed with the MA-200. Rounding out this list is the Royer R-121 Ribbon microphone, and deservingly so because for a 1K+ priced item, it continues to receive positive ratings and reviews, outscoring others that are cheaper and more accessible. Users and experts comment that the R-121 has excellent sound quality and build quality, and that its premium price tag is truly justified with some even saying that their high expectations are exceeded. The ability of ribbon mics to capture ambience may not be a good thing for some home studios, but experts and professionals find this feature important especially when injecting life and soul to a track. This "open" sound makes it ideal for acoustic guitars, resulting in professional quality and natural sounding recordings. Reviewers also noted the mic's ability to reproduce fine details of high frequency sounds better, making this one ideal for fingerpickers and strummers alike - even John Mayer was spotted using this mic on one of his YouTube live performance videos. And since it comes with a genuine Ribbon design with max SPL of 135dB, it can be used to capture high SPL sources like guitar amps, trumpets and other instruments. The frequency response is a bit different compared to conventional ones, at 30Hz-15kHz. Weight is fairly standard at 0.54lbs so positioning should be easy. Obviously the price is too high for many, but those that can afford it continue to give it their whole hearted thumbs up. If you're budget is limited, there are still plenty of options to choose from in the sub $100 price range. One of which is represented here, the small diaphragm Audio-Technica AT2020 which works really well in reproducing the high frequency zing of spruce top acoustics, without having to drill a hole in your pocket. This particular small diaphragm mic handles loud instruments well with a max SPL of 158dB with pad, without compromising much of the low end compared to other small diaphragm mics in this price range. This makes the AT2020 have a brighter sound which is ideal for steel string acoustics. The AT2020 still rates highly, with many pointing to its reliability and durability as its best trait, thanks to its sturdy metal chassis which is quite special in this price range. My only complaint, and others agree, is that it does not have multi-pattern capabilities, but it maybe asking too much considering the price. This is a great entry level mic for acoustic guitar players and is also a viable and practical addition to home studios that already have a good large diaphragm condenser. Since acoustic guitars produce similar frequencies to vocals, large diaphragm condenser microphones work great with them. These types of mics are widely available and versatile, making them the practical option, ideal for first timers and those working to a budget. Small diaphragm condenser mics and ribbon mics, with their high frequency response and high SPL capabilities, work considerably well with the acoustic guitar's inherent treble emphasis and varying dynamics . As such they remain to be the professional's choice, as evidenced by their presence in many performance stages and recording studios. While they are not advisable for for use as an all-around mic, they are ideal extra mics that can be used for acoustic guitars, miking other instruments and for adding space and realism to recordings. Cardioid is the most common polar pattern used on mic designs, because of its simplicity and effectivity. It is especially great for capturing single sound sources like acoustic instruments, where you just move the mic around to find the sweetspot and start capturing. Still, it won't hurt to have mics with multiple patterns because they can be useful for other purposes, like when capturing multiple instruments that play simultaneously. Pads allow microphones to better handle loud sound sources, especially when positioned up close. And since volume and dynamics vary from player to player, mics with pads allow for easy compatibility and positioning. These days, most condenser mics are built like tanks with tough metal exteriors, but it still pays to check the specs and pictures to see if the mic is solid. This is important because miking acoustic guitars require a bit more repositioning than when miking vocals, so there's always the tendency of bumping or falling off. As with all electronic devices, do handle with reasonable care. This guide gets another update for 2018, based on the most recent data on market favorite acoustic guitar friendly microphones. Compared to the previous update, the data we gathered is almost tripled, going over 8000 reviews and ratings, all of which were were processed via the Gearank algorithm. We used this data along with expert recommendations to measure the current market outlook for each microphone, while also taking into consideration our own experience to finalize the list. The result included large diaphragm and small diaphragm condenser mics, and also ended up having a tube condenser mic and a popular ribbon mic. Like the original version of this guide, we covered a wide price range so you can find one that suits your needs, whatever your budget may be. Note that if you have the funds, you should consider getting multiple mics, because using two or more will let you capture the finer details of an acoustic guitar, much like how professionals do. Click here for more information on how Gearank works.